The Jack Rose might just be the perfect fringe cocktail drink, bridging the season between summer and fall. Bright and fresh from the lime juice and the pomegranate in the grenadine, its inclusion of Applejack hints at the baskets of apples we'll soon be picking as the weather turns cooler and the leaves become brightly colored. 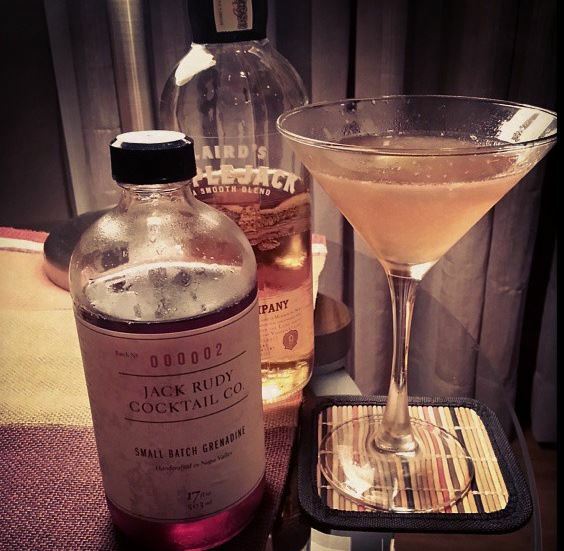 Though homemade grenadine is great, I really like Jack Rudy Cocktail Co.'s small batch grenadine, made with pomegranate, cane sugar and orange flower water. As with so many cocktails, its origins are questionable. (Alcohol is involved, after all, rendering fuzzy recollections...) One theory says it was named after or invented by the infamous gambler Bald Jack Rose. Albert Stevens Crockett, author of the 1931 book Old Waldorf Bar Days, believes it was named after the pink rose called the "Jacquemot". A third story goes that it was invented by Joseph P. Rose, a Newark, New Jersey restaurateur. The most obvious one? The name comes from the fact that it's made with apple brandy, and it's tinged pink from the grenadine. Here is the recipe from the back of the bottle of Jack Rudy Grenadine, which strays a little bit from the classic recipe, but works well when using their product. It only involves three ingredients, making it an easy choice when you want a great cocktail without much fuss. Jack RoseCourtesy of Jack Rudy Cocktail Co.
Add all to a cocktail shaker. Add ice, and shake until chilled. Strain into a chilled cocktail glass. Featured Wine: 2013 Bodegas Carrau Sauvignon Blanc "Sur Lie"